Vladimir Putin visited the Almaz-Antey Air and Space Defense Corporation, where he was updated on promising defense projects and held a meeting of the Military-Industrial Commission. 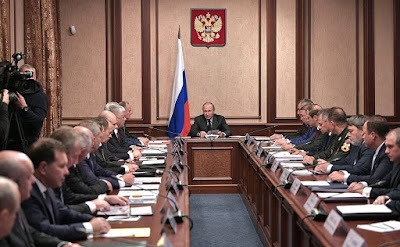 Vladimir Putin held a meeting of Military-Industrial Commission at the Almaz-Antey Air ad Space Defense Corporation. The Almaz-Antey Air and Space Defense Corporation is a Russian group of companies that design and produce air and missile defense systems. The corporation comprises over 60 plants, research and production associations, design bureaus and research institutes. The corporation produces ground and sea launched air defense missile systems and air and ground surveillance radar stations, automated control systems, as well as civilian equipment. 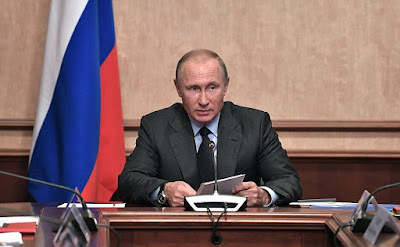 Opening speech of Vladimir Putin at a meeting of the Military-Industrial Commission. The Military-Industrial Commission is meeting at the Almaz-Antey Corporation. Before we start discussing the issues on our agenda today, I would like to congratulate the corporation’s personnel and the other workers in our defense industry on Defense Workers’ Day. As you know, a monument to Kalashnikov was unveiled in Moscow today. Vladimir Putin at the meeting of the Military-Industrial Commission. I would like to thank the researchers, designers, engineers and workers who create reliable quality weapons and equipment for their responsible attitude and diligence. I wish new labor achievements, health and well-being to all of you and to your families. Colleagues, today we will review a number of issues dealing with the development of the Army and Navy armament system and the further consolidation of defense industry organizations. One of the priority tasks of design bureaus, research institutes and defense companies is the development and production of advanced arms and equipment that determine the combat power of the Russian Army. 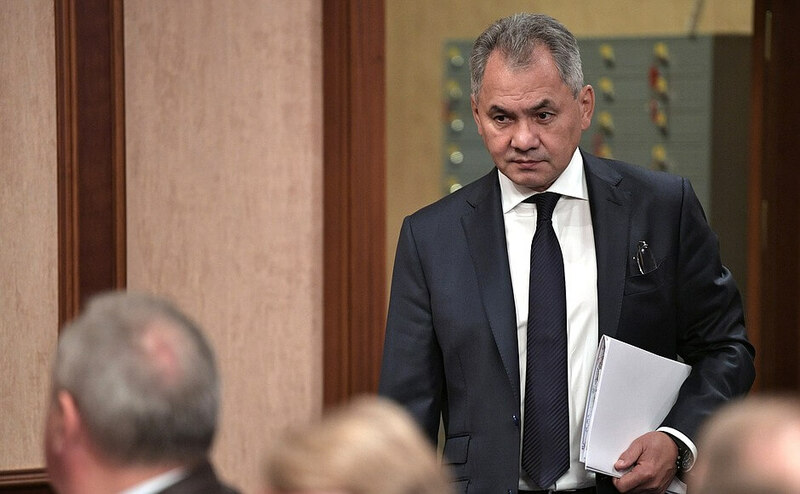 Defense Minister of Russia Sergei Shoigu before the meeting of Military-Industrial Commission. Importantly, it is necessary to keep this production independent of foreign components. For more than two years now, we have been carrying out the program for the import substitution of foreign spare parts and components for military production. Today I would like to hear your reports on how the industry is implementing the planned import substitution measures. Another important issue is the creation of a standard database on research and development, the results of intellectual activity and design documentation for military products. As you know, these data have not been systematized and are in the possession of both the state ordering customer and the main executor. 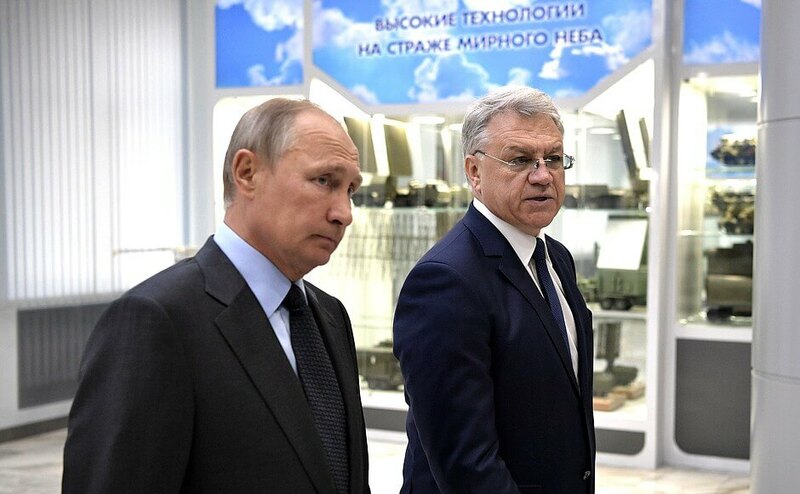 Vladimir Putin at the Almaz-Antey Air and Space Defense Corporation with Director General Yan Novikov. 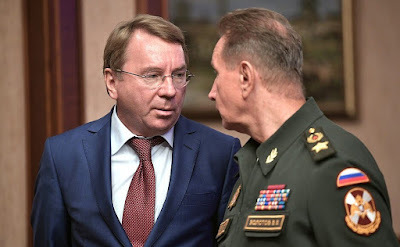 Meanwhile, this database will obviously enhance the efficiency of the application of the results of ongoing research and development, as well as military and dual-purpose intellectual activities and technologies, particularly through their application in civilian sectors. In addition, it will create favorable conditions for promoting innovative development and enhancing the competitiveness of the defense industry. Let me remind you that by 2025 the share of high-tech civilian and dual-purpose production should increase from 16 to 30 percent of the total commercial output. I would like to discuss in detail the modernization of defense industry enterprises. 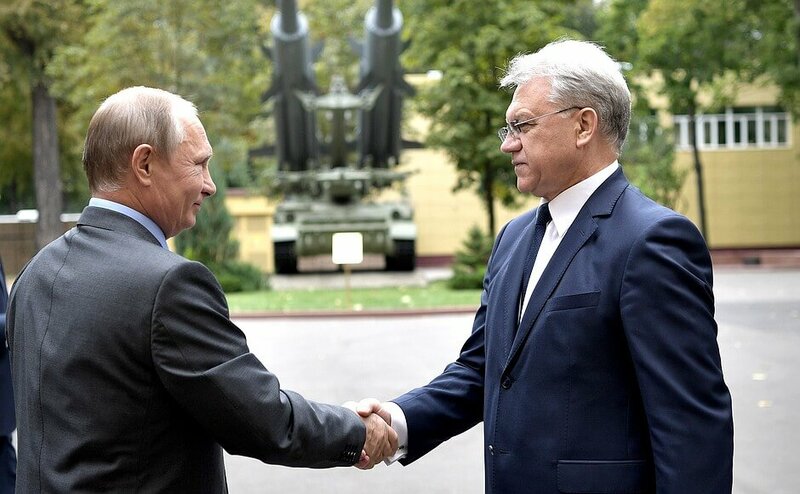 Vladimir Putin with Director of Almaz-Antey Air and Space Defense Corporation General Yan Novikov. In May the question of assessing the efficiency of capital investment and its influence on reducing the cost of military output and decreasing the production cycle was raised at the meeting in Sochi. Judging by the report on implementing state policy on defense industry that the Government submits every year, technical re-equipment is having a positive influence on the economic performance of defense industry enterprises and is enhancing their potential to produce advanced commercial armaments and equipment prototypes. Overall, the defense industry reports sustainable growth rates that are higher than in many other industries. More precisely, output in the defense industry increased by 10.7 percent in 2016. Year-on-year production increased last year in all sectors, but growth was especially high in the electronics industry (18.5 percent), in the production of munitions and special chemicals (nearly 14.5 percent), conventional weapons (over 10 percent), aircraft manufacturing (9 percent) and shipbuilding (nearly 4 percent). 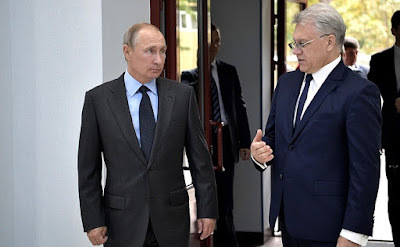 Vladimir Putin with Yan Novikov at the Almaz-Antey Air and Space Defense Corporation. It is especially gratifying that production efficiency in integrated companies increased by 8.8 percent on average, while wages grew commensurately, which is a good sign. The majority of integrated companies balance labor efficiency growth and wage growth per worker. However, labor efficiency at our companies is still lower than at their foreign rivals. Therefore, they need to continue reducing the prime cost of their produce by introducing resource-saving technology, streamlining their capacities and procurement activity, and other measures. Before we start discussing the items on our agenda today, I would like to mention one more issue. We have said many times that we need an effective system of fundamental and applied research, under which breakthrough technology will be introduced in production to strengthen national defenses and bolster our economic growth. One possible form of this is a modern innovative techno polis or technology park, which will have conditions for creative activity by both young and experienced researchers. Personnel for this park can be recruited from the research platoons, which have proved their worth, from research institutes, corporation design bureaus and other related institutions. Defense Minister Sergei Shoigu has updated me on these ideas. I consider them to be interesting and promising. We must think about implementing them. And now let us get down to work. 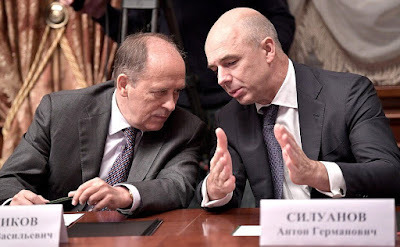 Head of the Federal Security Service Alexander Bortnikov (left) and Finance Minister Anton Siluanov before the meeting of Military-Industrial Commission. Presidential Aide Andrei Belousov (left) and Secretary of the Security Council Nikolai Patrushev before the meeting of Military-Industrial Commission. 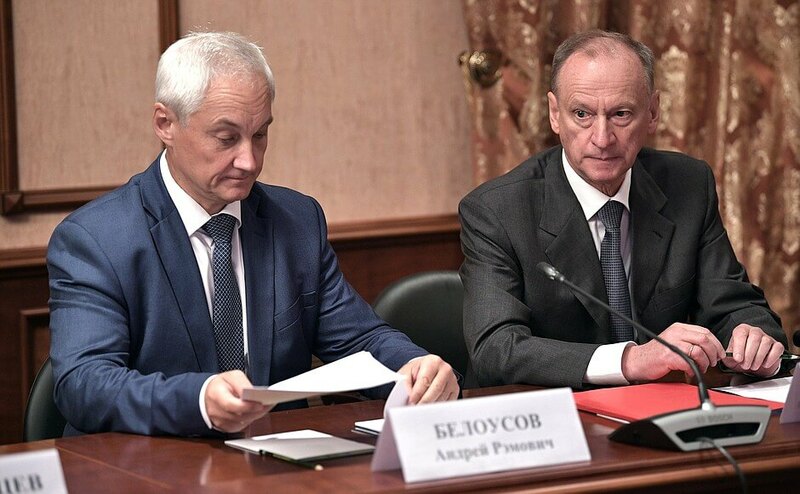 Head of the Foreign Intelligence Service Sergei Naryshkin (left) and Minister of the Interior Vladimir Kolokoltsev before the meeting of Military-Industrial Commission. 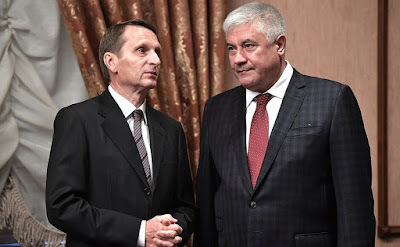 Presidential Aide Vladimir Kozhin (left) and Director of the Federal National Guard Service and Commander-in-Chief of the National Guard Viktor Zolotov before the meeting of Military-Industrial Commission. 0 Comment to "Vladimir Putin held a meeting of Military-Industrial Commission"